China’s consumer price inflation accelerated to 2.3% in March from 1.5% in the previous month. The producer price inflation accelerated to 0.4% from 0.1%. Both indicators matched forecasts exactly. The Melbourne Institute Survey of Consumer Inflationary Expectations showed that the expected inflation rate in Australia fell from 4.1% to 3.9% in April. 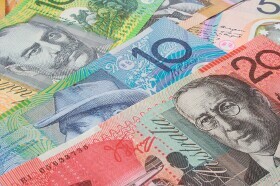 AUD/USD dropped from 0.7171 to 0.7141 as of 13:05 GMT today. EUR/AUD gained from 1.5719 to 1.5768. AUD/JPY slipped from 79.60 to 79.50.